Ruthiebear (Titusville, NJ, United States) on 14 July 2017 in Lifestyle & Culture. Your country flag is a good reason to be proud of. Les drapeaux sont de sortie aujourd'hui en France. Superb composition with reflections and colors . Bonjour Ruth, c'est tout beau, superbe! Bise, bon vendredi dans la joie! Very nice colour toning that you have introduced here. The flags and the reflections from the windows are great. Excellent color. A nice shot of your flags. I like flag and picture ! Very beautiful and clever framing with the reflections on the flags! An interesting composition of flags in their setting. I like showing high regard for our flag. Stunning image in beautiful light and with the fantastic bokeh. Excellent treatment. Awesome! I love it! Hugs! Excellent image of the beautiful display. 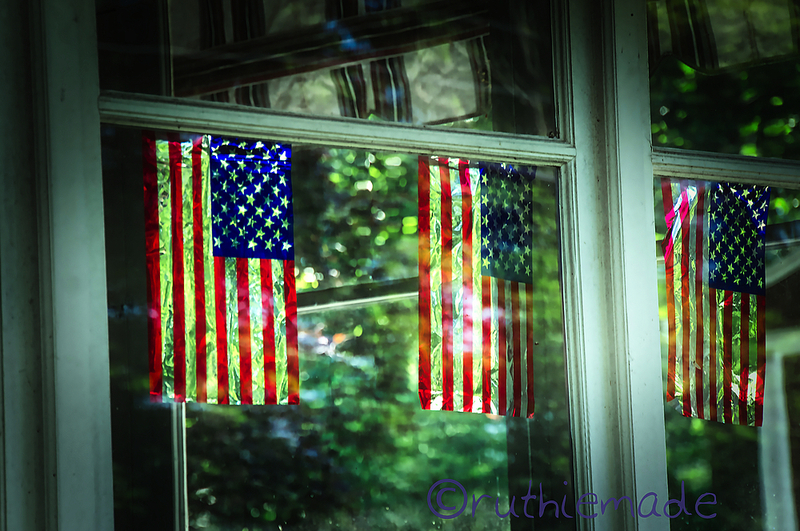 I like the tinfoil like flags, nice light on the foliage and reflections. La bannière étoilée sera toujours un symbole fort ! Beautiful glistening light captured off of these colorful foiled flags!! The light and the the reflections are just beautiful! A gorgeous image! Being Canadian, I have difficulty understanding the displays of flags but that is a very cool image. A great flag, a strong symbol. such beautiful frame, lights, bokeh & reflections!